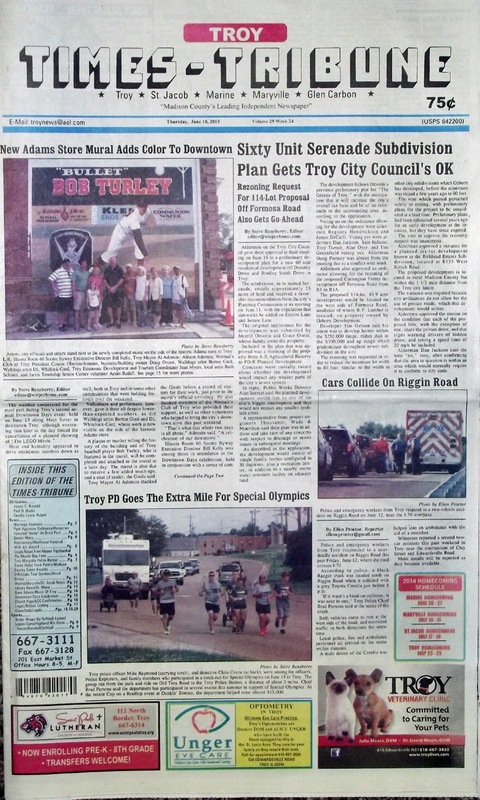 The June 18, 2015 issue of the Troy Times-Tribune is now available! 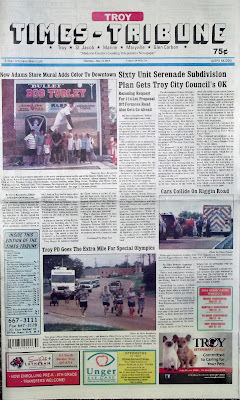 Some of the headlines in this issue: Sixty Unit Subdivision Plan Gets Troy Council's OK, New Adams Store Mural Adds Color to Downtown, Cars Collide on Riggin Road, Troy PD Goes the Extra Mile for Special Olympics, Tri-Township Park Board Approves Appropriations Ordinance, Butler Wraps Up College Softball Career in Style; plus we have police blotters, an editors column on fathers and fishing trips, a full page feature on Gene Adams and the Music of Troy, and a full page of photos from this year's Downtown Days celebration. This issue has obituries for James C. Brendel, Paul D. Hooks, and Cecelia Leona Hubert.